J.M. 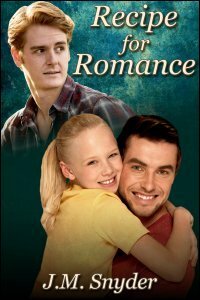 Snyder » Recipe for Romance is now available! Recipe for Romance is now available! My latest novel, Recipe for Romance, is available today! Preston Pruitt put aside his dreams of becoming a gourmet chef at a high-end restaurant to raise his daughter while her mother was on active duty in Afghanistan. Now Abby is a precocious eight-year-old in love with fairies and princesses, and Preston works at an unimaginative and monotonous job as a short order cook. Abby has her quirks, and when she tries to wear a pair of costume wings for her school pictures, her father is called to help talk her out of them. That’s when Preston meets Cam Richards, a handsome photographer with his own studio in town. Between Cam’s quick smile and flirty manner, Preston is smitten and surprises himself by asking the guy out. Late night phone calls lead to dinner dates, and soon Preston is falling for Cam. It helps that Abby approves of her father’s new special friend. With Cam’s encouragement, Preston gets the chance to interview for an executive chef position. Now that he has all the ingredients, will he finally fulfill his dream of becoming a top chef and find the perfect recipe for romance?